Excerl Timesheet Creation is an ideal solution to automatically generate employee timesheets based on a set of scheduling options. 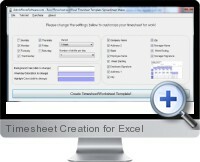 The simple user interface for Excel Timesheet Creation presents options required to create the timesheet including timing information, color formatting and field information to include. Create timesheets with minimal effort and time while also ensuring consistency for timesheets across multiple employees. Created Excel timesheets are customizable for business needs: Choose which days of the week should be included, which fields should be incorporated (such as employee name, manager name, company name, etc. ), the number of daily work shifts, plus much more. Style the timesheet cell coloring for weekdays, highligh and default to match exteing reporting formats of corporate branding.